Pratima Patel, Esq. is Of Counsel at Pasricha & Patel, LLC whose practice areas focus on real estate, business transactions, commercial leasing and financing. She represents individuals and entities in the acquisition, sale and finance of privately held businesses, franchises, commercial real estate, residential real estate and mixed-use properties. She also represents property owners and tenants in commercial and retail leasing matters. 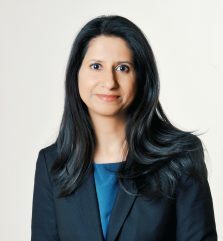 Pratima has extensive drafting and negotiating experience involving asset purchase agreements, real estate contracts, loan financing documents, management agreements, shopping center leases, and ground leases. She strives to meet the legal needs of her clients by working with them to understand their goals so that she can provide effective and personalized representation. Pratima maintains a strong commitment to the community through her support and involvement in non-profit organizations. She currently serves on the Board of a non-profit that helps women and girls escape from forced marriage.